Queens Invisalign® dentist, Dr. Adam Lublin, and orthodontist, Dr. Peter Feibish, have been premier preferred Invisalign clear braces providers for over ten years. While many people wish for straighter teeth, they may be apprehensive about how metal braces make them look. 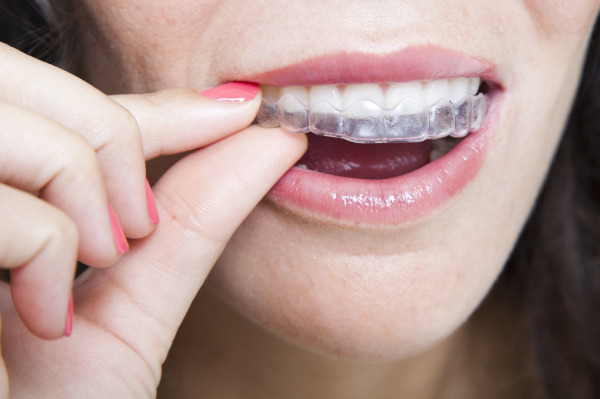 The Invisalign clear aligner system has created a modern approach to straightening teeth that correct orthodontic issues while allowing patients to look their best. Our goal is to provide high-quality dental that helps patients gain the smiles they have always wanted. Contact Dynamic Dental Center today for your cosmetic braces consultation. Invisalign clear aligners are plastic retainers that gradually shift teeth into their proper place. Anywhere from five to twenty-nine aligners can be created and are to be worn for two weeks at a time. The best part is that Invisalign aligners are completely removable and virtually invisible. No one has to know you’re wearing an orthodontic appliance and you don’t have to modify your eating or brushing habits. Invisalign braces are removable; patients can eat and drink and keep their smiles clean without having to worry about maneuvering around fixed appliances. Checkups are easier with Invisalign as well. Come in for a quick appointment where we’ll check your smile for alignment progress and provide you with the next aligner in your treatment plan. Before creating your treatment plan, Dr. Lublin performs a dental exam, takes x-rays, and fills any existing cavities. We create a foundation of positive oral health before moving onto additional care. To have your clear braces fabricated, our Invisalign dentist takes impressions of your teeth and sends them to Invisalign’s laboratory. Based on your unique impressions, your Invisalign trays are created along with a virtual time-lapse guide that explains how your smile will evolve using this orthodontic system. We help you visualize your beautiful new smile before your treatment plan is complete. Once you have received your trays, you should wear them for twenty-two hours per day, only removing them to eat, brush, and floss. As with many orthodontic treatments, it may take some time to get accustomed to your new appliances. As you continue to wear them, you will become adjusted to how they feel; compliance is key in creating ideal results. Although each case differs, many patients see results within twelve months. Call Us Today for your Clear Braces Consultation! By correcting orthodontic issues, our dentist and specialist support improved oral health as well as beautiful new aesthetics. If you would like more information about the cost of Invisalign trays or if you are interested in finding out whether Invisalign orthodontics is right for you, contact Dynamic Dental Work in Queens today!